This tutorial video takes you through the IUPAC and common rules for naming epoxides or oxiranes. Examples include simple epoxides, substituted ring and larger molecules containing the epoxide or oxirane. 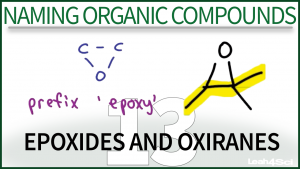 This is Video 13 in the Naming Organic Compounds Video Series. Click HERE for the entire series. i love your videos thxxxx^^ ,,but i’m wondering how to name a cyclic ether !! Very helpful videos! Do you have a list somewhere of the order of priority of the functional groups? I’m never quite sure which one takes precedence. Thanks! im currently watching videos on naming organic compounds! thank you so much it helps me on the test! You are very welcome. When is your exam? Thank you Angela – I’m so glad I can help. Which topics are you studying right now?